In the town of Banff, Alberta, a historic site is located at the base of Sulphur Mountain known as the Cave and Basin. The reflection pool at the Cave and Basin was once fed from waters of a natural hot spring which offered many therapeutic qualities. The pool brought in many travelers in the late 1800's who would seek a relief from their various ailments and troubles. As the 1900's arrived, the pool at this Cave and Basin National Historic Site was used for swimming and relaxing. This was soon converted into a reflection pool with a replica of the original 1887 bathhouse at one end of the pool. A fascinating step back in time where visitors can explore this unique historic site while visiting Banff National Park in Alberta, Canada. 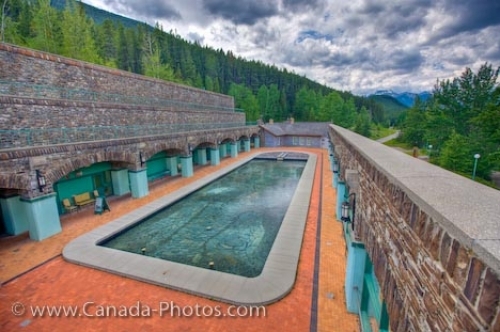 Photo of the reflection pool at the base of Sulphur Mountain at the Cave and Basin Site in Banff National Park in Alberta.